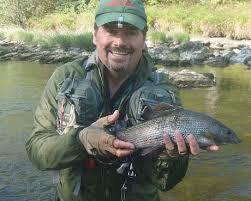 We are lucky to have one of Wales’ top fly fishing experts, Kim Tribe, who is our new resident fishing coach and guide. He has many years experience fly fishing the River Usk, and has a unique insight into our local rivers. Under Kim’s expert tutelage and with his unlimited local knowledge, you will be guaranteed a unique fishing experience – whether you’re a competent fly fisher or a total beginner. He has fished all over the world but believes the Brecon Beacon offers absolutely everything for the keen fly fisherman. Kim guides our customers around the best waters in the area, from stalking wild trout in small upland streams to landing sewin, trout and grayling on the main rivers. Learn to cast, enhance your knowledge on river craft, take an improvers course, improve your techniques, or have a full on adventure on a Fly Fishing Safari, you’ll be in safe hands with Kim Tribe. If you fancy fly fishing the River Usk, the Manor Hotel is situated close by and the river also passes our friends at the Glanusk Estate, which offers fantastic trout and salmon fishing. Our sister hotel Peterstone Court also sits on the River Usk on the “MillBrook’ stretch of water, nearly a mile of river situated directly below the hotel. Easy access to the beats, easy wading, variety of water – top end is a weir pool great for dry fly fishing; then pocket water (interesting and challenging nymph fishing water); nice wet fly fishing both up and downstream; a long glide for dry fly fishing; a nice crease channeling down river into the salmon pool. The tail end of the beat broadens out into wide tail good for downstream dry fly fishing. Kim Tribe, knows the rivers in the area intimately and we can offer fishing all year round, on a variety of different rivers, from small trout streams to larger fast flowing trout and salmon rivers like the Wye or the various grayling waters in the area. Within 15 minutes we can transport our clients in any direction to match their fishing needs. Local 4×4 transport is provided. Our customers can also go ‘off piste’ and book a range of ‘not normally accessed’, private beats as we can offer access to a variety of private syndicate waters with Kim. Transport can be arranged to and from the rivers. If you don’t have a fishing license, Kim Tribe will obtain this for you. He will organise all fishing permits for local rivers and the cost of these is included in our prices. You don't just need to stick to fly fishing the River Usk, bespoke fishing trips and safaris can be organised with Kim Tribe on local rivers and lakes nearby. Group rates and bespoke days are negotiable separately. Costs are from £175 per person per day with our Fishing Guide/coaching, or £250 per day for two people, inclusive of fishing permits. Of course all guests staying at our hotels are welcome to fish on our local rivers with or without our fishing guide. Please ask Reception for details.